Christening is the service that usually involves baptising with water, but there is also a more simple service of thanksgiving too. There are more details below and on the new Church of England Christenings website. Do make contact with our vicar Rev Sarah Godfrey to see which service may be right for your family. Baptism marks the start of the journey of faith as someone becomes a Christian and joins the family of the Church. 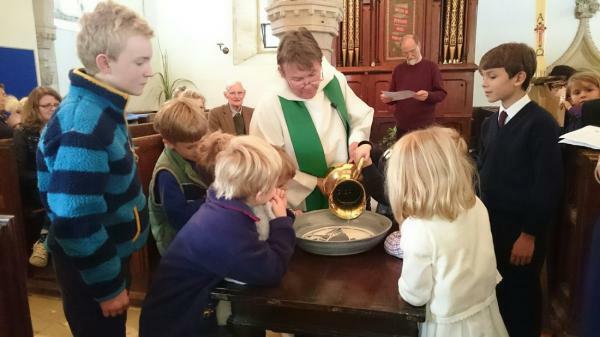 Children and adults can be baptised; both make promises about the commitment they are making to follow Christ. Parents and godparents make those promises on behalf of the youngest children. Thanksgiving is a service of saying thank you to God for the gift of a child. It can come before baptism or instead of baptism if you don't yet feel ready to make a full Christian commitment on behalf of your child. To find out more give Rev Sarah a call on 01963 250248 or email her at revsjgodfrey@gmail.com.